I love Kung Pao chicken and the exciting buzz it gives when eating it. 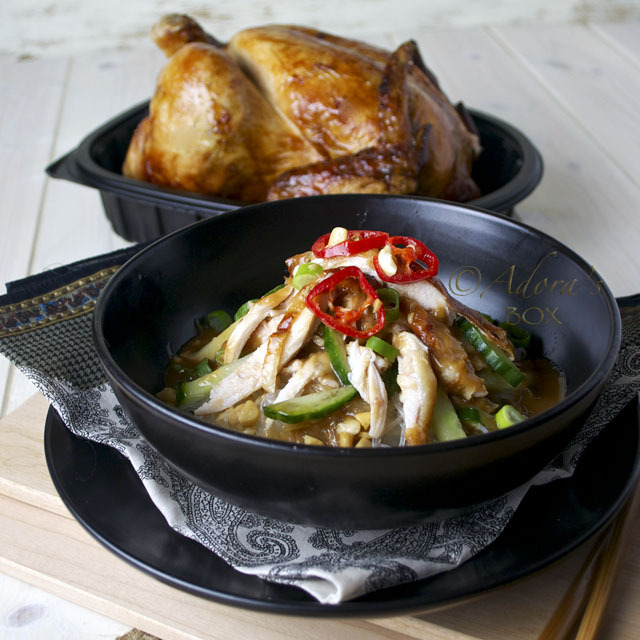 Kung pao chicken is a classic Szechuan dish of chicken and peanuts in a fiery hot sauce spiked with Szechuan peppercorns and dried chillies. It is that double hit of peppers that make this dish so exciting. The Szechuan peppercorns has a citrusy flavour and a numbing effect in the mouth. 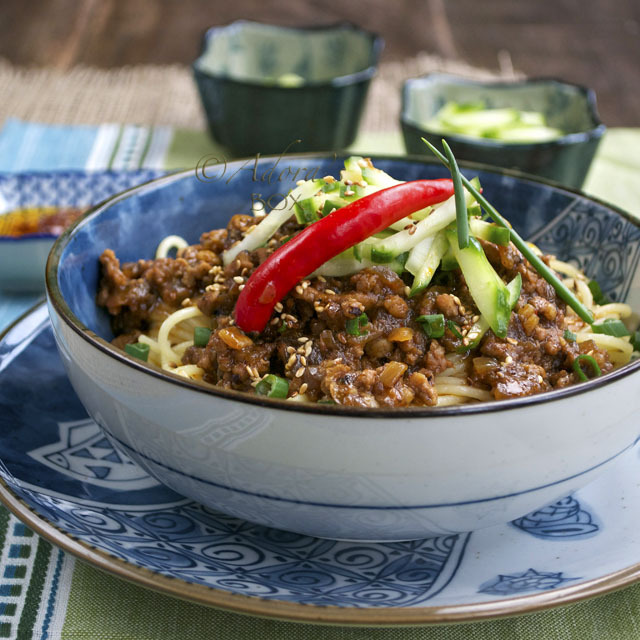 The dried chillies has a hint of smokiness and distinct chilli flavour and heat. 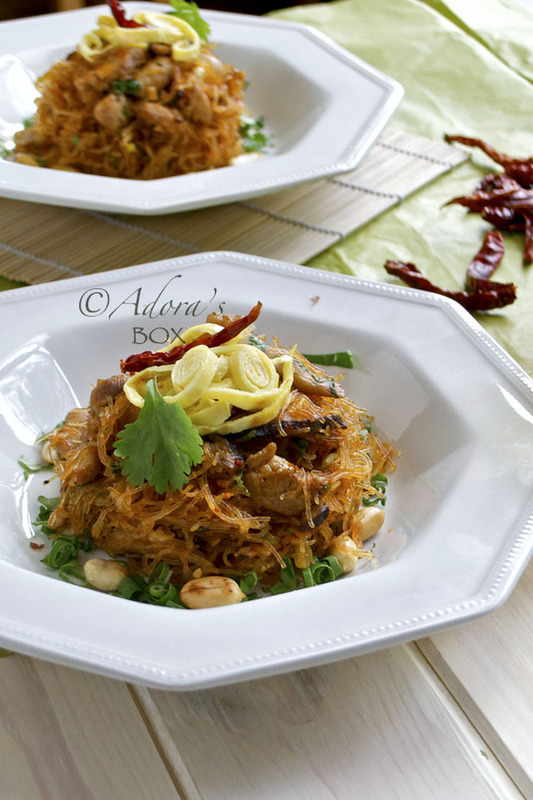 Although good with rice, I thought adding glass noodles would be a great one dish meal. I'm glad to say that my thoughts were right and the result was more satisfying than eating it with rice. Though it only has a few ingredients, it is very aromatic and has an oh-boy-its-hot sort of kick. I am probably not very good at describing taste and the sensation but putting it simply, it is the sort of food that makes you want to eat more...and more. You'll also be glad to know that the whole dish takes only a few minutes to prepare. 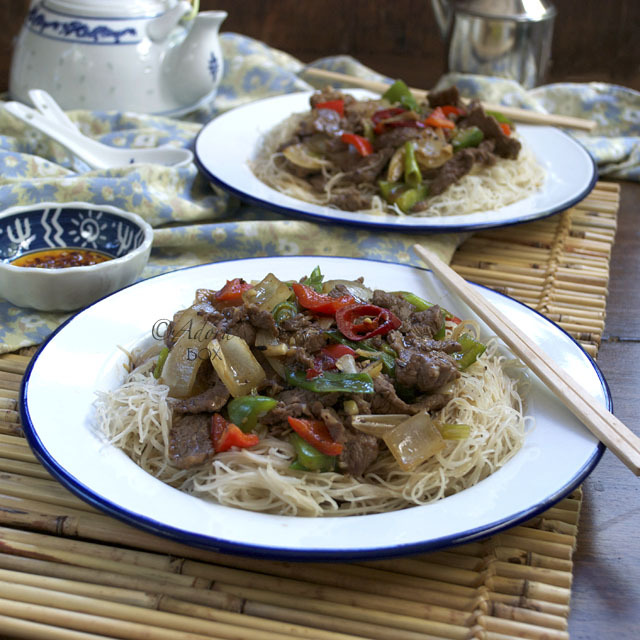 As with all stir fries, have everything ready and on hand so that you can quickly throw everything in very quickly. I have opted to add the peanuts at the end, as a sprinkle, to keep its crunch. Along with the coriander leaves, spring onions and omelette strips, it enhances the already tasty dish. 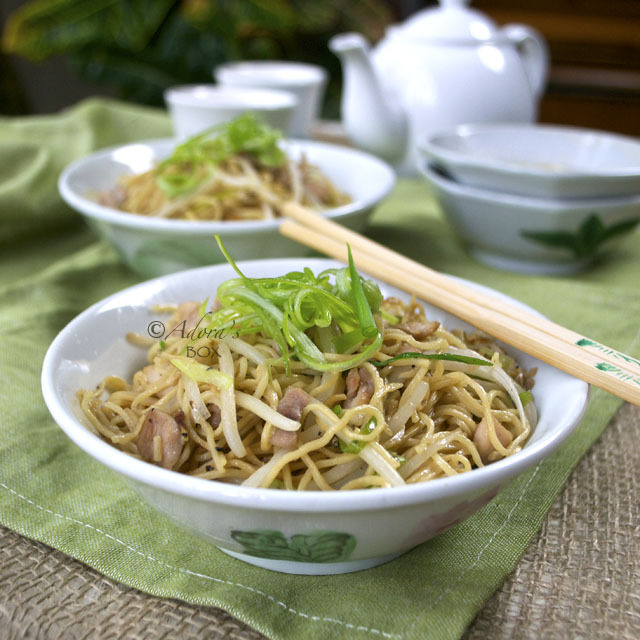 Soak the noodles in warm water to soften for 5-10. Drain very well. Cut the chicken into thin strips. Season with the 2 tsps. of light soy sauce and 1/2 tsp. of sesame oil. Set aside. Make 2 omelettes with the beaten eggs. Roll and cut into thin strips. Set aside. Heat up 1/4 c. of oil in a wok and fry the peanuts until browned. You can use either skinned or skinless peanuts for this. Peel the peanuts after frying if using the skinned ones. Set aside. Whisk together the tomato puree, chicken stock, vinegar, brown sugar and light soy sauce to make a sauce. Set aside. Heat up a wok. You can use the same one used for frying the peanuts but reduce the oil to 2 tbsps. Add the chopped garlic and stir fry for 1 minute. Add the seasoned chicken pieces, the dried chillies and the Szechuan peppercorns and stir fry again for 2 minutes. Add the white parts of the spring onions and the softened noodles. Stir fry again for 2 minutes. Add the sauce and stir fry until all of the sauce is absorbed and the noodles are done, about 4 minutes. Add the sesame oil and the green parts of the spring onions and stir. Take off the heat and transfer to a serving dish or four individual bowls. Sprinkle with the omelette strips, chopped coriander and peanuts. Oh Adora, I loves this....I loves fried glass noddles or what I call in Chinese is "tung hoon". I even heard from chinese chef that it is not easy to fried tung hoon, right? 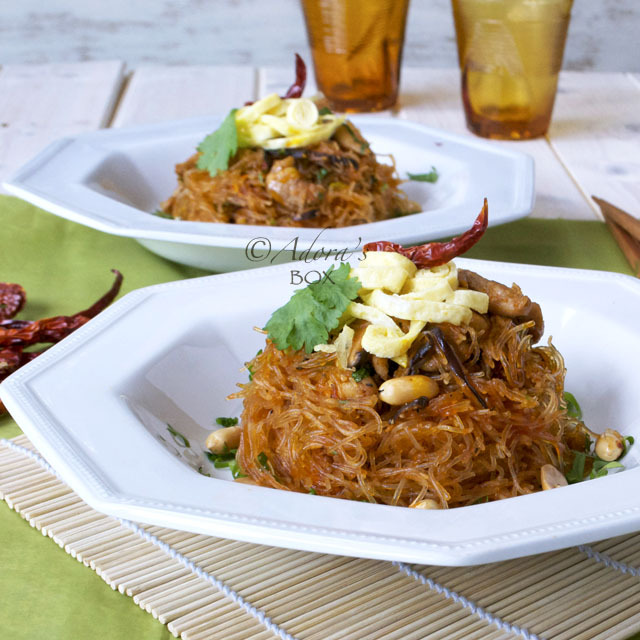 With Kung Pao Chicken in this glass noodles must be awesome in taste! Wish I can have just one spoonful to taste it. We call it sotanghon in Tagalog, Mel. It sticks to the pan when fried so I stir fried it for just 2 minutes then added the sauce to give it some liquid to braise in. why didn't i ever hear of these glass nooodles before?! they truly look delicious and are so pretty to look at. i now pronounce you the queen of noodles and pasta dishes because any time i see your creations, i just want to stuff my mouth with them...hhah. Kung pao chicken is one of my favorites as well! What a fabulous recipe! 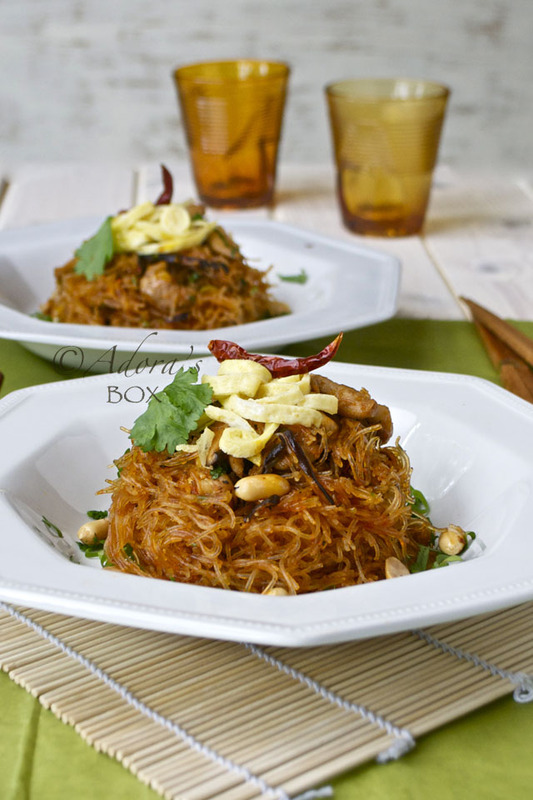 I love the use of the glass noodles and your seasonings. thanks for the great instructions on how to make this! I think that's a great idea, Tiffany. Sort of like Ma Po Tofu on glass noodles. Good job on exploring your dish. It sure looks tasty. Noodles are one of my favorite dishes. It gives me great satisfaction everytime I eat one. Thanks for sharing your recipe. I'll certainly try this one out.